Kii and Saidokā have been engineered to perform brilliantly and look stunning with careful attention paid to their clean and minimalist designs. Expanding its lineup of iPhone and iPhone 5 compatible products, Bluelounge today announces the addition of Kii and Saidokā to meet the increasing need for more charging options amongst iPhone 5 users and those making the transition between phones. As with all Bluelounge products, design is central for both Kii and Saidokā. Engineered to perform brilliantly - Kii and Saidokā also look stunning - with careful attention paid to clean lines and minimalist features. Unlocking ultra-portable connectivity, Bluelounge introduces, Kii. Designed for on-the-go consumers looking to stay synced and charged, Kii is a compact connector that eliminates the need to carry a charging cable and fits on a keychain for ultimate convenience, accessibility and mobility. •Ideal for frequent travelers or those who live by their laptop, Kii is as lightweight and inconspicuous as any other key on a keychain and allows users to plug into the USB port of their laptop to charge or sync devices. •A lifesaver in the event that a charger or cable is left behind, Kii is an emergency connection to have on hand, always. •Simple in both style and function, Kii features a self-locking cap to ensure it stays securely fastened to the keychain it’s connected to. •Perfect for those transitioning between iPhones, Kii is available in a Lightning version, compatible with iPhone 5, at a suggested retail price of $39.95 as well as a 30-pin version, compatible with iPod and iPhone 4/4S, at a suggested retail price of $19.95. Redefining the way phones should be docked, Bluelounge introduces, Saidokā, a rock-solid dock to charge iPhones horizontally on your desk. At the same angle as your keyboard, supported and with a clean and simple design, Saidokā makes docking and using your iPhone while charging, easy. 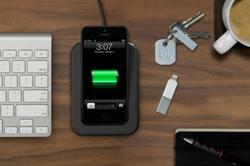 •Uses high-tech Japanese Micro-Suction rails across the bottom to easily dock and undock iPhones with a single hand. •Features a smooth rubber bumper to customize the fit, depending on whether there is a case on the phone or not. •Saidokā is available in a Lightning version, compatible with iPhone 5, at a suggested retail price of $49.95 as well as a 30-pin version, compatible with iPhone 4/4S, at a suggested retail price of $29.95. For more information on Kii and Saidokā, visit http://www.bluelounge.com. Bluelounge products are currently available online and at select retailers worldwide. To find a retailer nearby, please visit our store locator. Note to reporters: High-res images are available here: http://www.bluelounge.com/media.